Hawaiian Slack Key guitar music helped summon the coming Spring weather as more than 90 people gathered for a free musical evening at the Bahr Gallery. The band, One Trick Pony, was terriffic featuring Ben Diamond on Slack, Jeff Brody on bass, and Dan Doll playing alternately blistering and souful lead guitar. 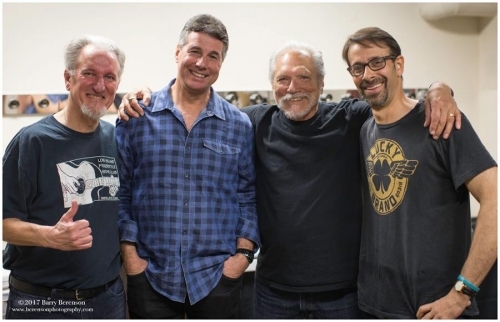 We heard an engaging mix of original music heavily influenced by Hot Tuna and the island sound of Hawaiian Slack Key guitar playing, plus some Grateful Dead interpretations and other tunes from the late 60s and early 70s. The kitchen, full of art and people.